Lightning specific headphones have been on the rise ever since consumers stopped grumbling and finally accepted that their new iPhone won’t have a headphone jack. While some are still holding out and using an adapter dongle, there are becoming more and more reasons to finally give up the dongle and finally get a pair of dedicated lightning headphones. The Aqua earbuds are a very quick and VERY affordable quick-stop solution for anyone looking to get rid of that dongle life in exchange for something more practical, again, without breaking the bank. Viotek, while not necessarily a leader in the audio industry, does have a reputable history of producing quality electronics goods from keyboards to curved LED televisions, so quality is not much of a worry when it comes to their new Aqua Lightning earbuds. These earbuds are fully MFi certified, which is Apple’s own electronics accessory certification, so you know they’ll work seamlessly with your Apple device. 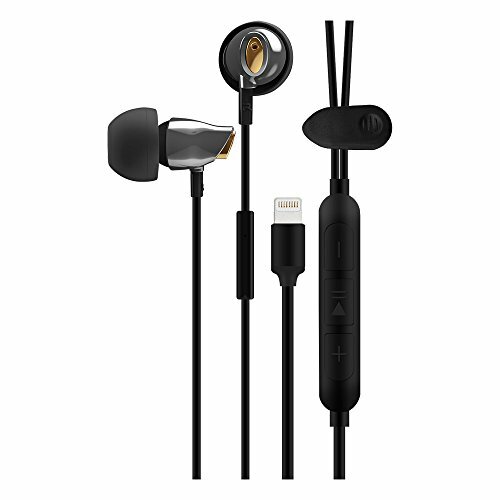 These are lightning-cable out-of-the-box ready earbuds that can be found for as low as $39.99 online, but are officially listed at $59.99 on Vioteks official website, and come with a whole plethora of accessories to further update the “value” proposition with the Viotek Aquas. These are full-blown sturdy lightning earbuds for iPhones and iPads. Featuring a 47-inch long cable with an in-line microphone and controls they have all the necessary control features found on all current for-Apple type of headphones. Essentially, these bad boys do exactly what Apple’s OEM earbuds do but they look much better doing it. The earbud unit itself is hypoallergenic and made of ceramic, a solid sound transmitting material that produces a nice clean sounds without any distortion or “rattling” sometimes found in all-plastic units. The cable is thick and feels quite sturdy with a very thick connection between the lightning plug and the cable, a known weak spot even for Apple’s own charging cables. What about the sound? Well, that’s probably the best part about these budget earbuds. The Aquas transmit your audio at 16 BIT/48kHz pure lossless digital levels. This is because the lightning cable can transmit this high quality lossless audio unlike old school analog earbuds. So, if you stream your music in HD via Tidal or another streaming service, or you prefer downloading high-resolution digital file types, these earbuds will play back the music in all of its digital glory. With 105dB 8mm drivers sounds are produced accurately and efficiently, getting far louder than you’d ever need without the need for any sort of amplifier or external battery pack. There are also a whole bunch of accessories that come out of the box with the Aquas, including 12 different sized earbud tips, both rubber and foam, for you to swap out and guarantee a perfectly snug fit in your ear canal. There is also a carrying bag with a clip and even a phone thumb holder you can use to better hold your phone while listening. In terms of overall value for dollar, the Aquas from Viotek are probably the best bang-for-your-buck you can get in the lightning-only headphone segment. Whether you are looking for something to use for daily use, or something to use at the gym, this low cost option presents very little financial risk for huge audio-pleasure reward.